In 1958 Arthur Radebaugh started the syndicated Sunday comic Closer Than We Think! It ran in newspapers until early 1963. 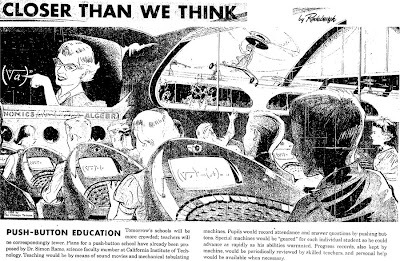 The strip really epitomizes the optimistic brand of futurism so common in the post-WWII era. 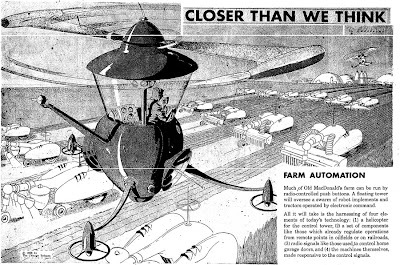 Below are a few great examples of this paleo-futuristic strip from the Chicago Tribune. "Teaching would be by means of sound movies and mechanical tabulating machines." "TV sets the size of postage stamps will soon be worn on the wrist, each with a personal dialing number." "Here, for tomorrow, is the concept of policemen on mechanical pogo platforms ..."
"A floating tower will oversee a swarm of robot implements and tractors operated by electronic command." 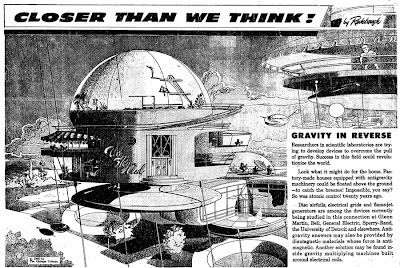 "Factory-made houses equipped with antigravity machinery could be floated above the ground - to catch the breezes!" I've admired Arthur Radebaugh's work for a long time now. Does anyone know where to get those monochrome posters of his art that were making the rounds a few years ago? 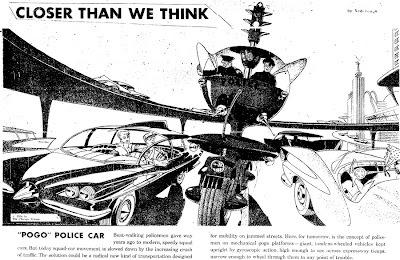 Take a look at the flying cars in the antigravity panel -- one on the ground, and one flying -- this predates the Jetsons by 5 years... convergent paleo-future evolution, or theft of intellectual property?